The Third Anniversary of the Bread Baking Babes is at hand. For this truly celebrational post each Babe was invited to choose one of the breads baked during the last three years and bake it. Since we usually all bake the Bread of the Month...all the same bread recipe with personal tweaks here and there...this is unusual. Looking at all the wonderful choices was both thrilling and daunting. Which to make? 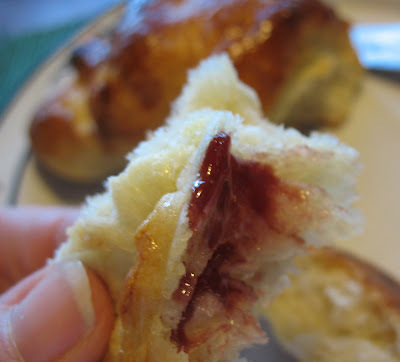 Fortunately Sweetie helped me out by praising the light and flaky croissant he had purchased at a local bakery. They use lots of butter and truly make a great pastry. I've had the opportunity to make them while being a Daring Baker and again when the Babes made them in January of 2009, but somehow I never did. What could be a better challenge since I knew that my favorite person would enjoy the results and February should be a nice cool time of year to do laminated dough. The first assumption was true. I won't tell you how many he ate, but Sweetie really did enjoy these golden croissants. The second assumption, that February would be cool and perfect for laminating dough, was not. I made them on the last Sunday available to me before we posted...this past Sunday being my birthday and a day I had planned a women's tea party for Valentine's day. Since laminated dough takes most of the day I wanted to do it on the weekend. Imagine my dismay when I found out that the Sunday forecast called for 74 degree heat! But it was even worse. The actual temperature ended up being 80 degrees. There was much swearing and banging of pans by the afternoon because the kitchen was at least that hot. Since I was baking Spritz cookies it probably was hotter. Can we groan 'laminate'? To top it all off, it was also Super Bowl Sunday, so all that banging and swearing was noticed. Being an intrepid soul I kept going but found that I needed to put the dough packet in the freezer between turns in order for the dough to cool down enough. Even so the butter was softer than it should be. Some even squished out of the dough as I rolled (See the butter squidge on the rolling pin?) so I used a piece of plastic wrap under the rolling pin and then scraped up the butter and put it back on the rolled out dough before making the envelope folds. Even though it seemed unlikely that it would all work out, by the last turn (and I added a couple to finally bring the dough together in the late afternoon) I felt like the dough was OK and might even make some good bread. By the time they were shaped, had risen, had gotten their egg wash and were baked it was something like 9 pm. Since I had started at 7 am that was a clue that I wouldn't be doing this again soon. Still, if it weren't for the fabulous Bread Baking Babes, I might never have tried. 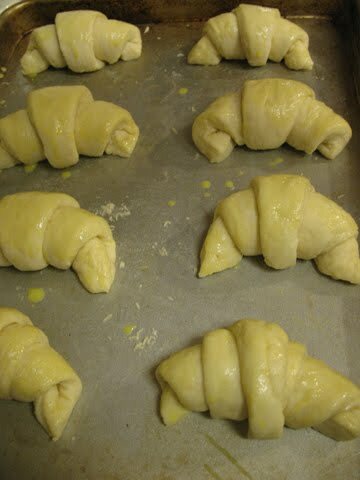 It was truly a delight to pull the first pan from the oven and see the golden, gorgeous croissants! 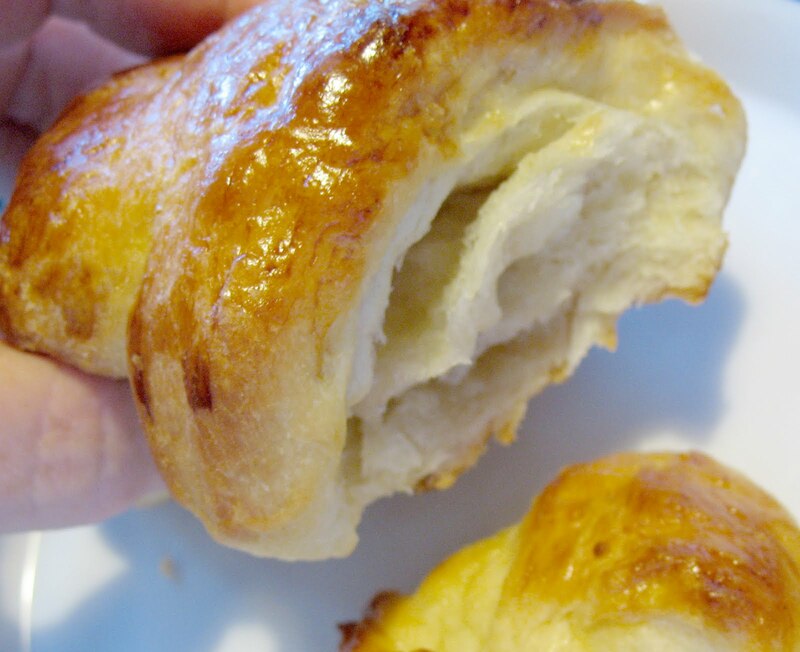 Who knew that home-made croissants could be so good, heat and all? They were flaky and tender and golden and even good the next day. Sweetie enjoyed some, I had a couple, a few went to Grandma L and a couple went to friends. 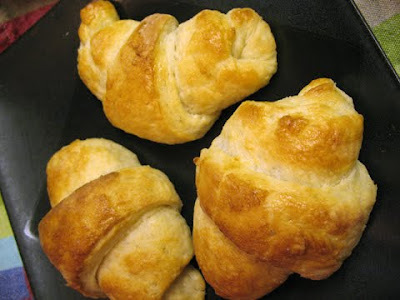 They might not have given Parisian croissants a run for their money but they beat out ones from the grocery store...more delicate and buttery! You, too, can celebrate the Bread Baking Babes Third Anniversary. We had originally asked for your suggestions and I have to thank Tanita and Next Sister Down for great suggestions. I hope to bake your suggestions in the near future. As sometimes happens, the plans for the celebration changed. Now the challenge is to choose, just as I did, from one of the breads baked by the Babes in the last three years, bake it and post about it by the end of the month. Here is a link to Lien's page where she has the photo collage plus links for all the breads baked those three years. Once you do that, send a link to Tanna, our Kitchen of the Month, and she will do a roundup of Buddies. We hope that lots of our Buddies from the past, plus new Buddies, will meet the challenge and make this a memorable anniversary celebration! Need some inspiration? Check out the posts of my fellow Babes...the links are on the right sidebar near the top of the blog. Also, please take a moment to admire the gorgeous new badge created by Lien in honor of the anniversary. So colorful! Here is the recipe for the Croissants, copied from the Kitchen of the Month for January 2009 when the Babes did this challenge, including comments, minus photos. Copied fairly accurately from an article in France Magazine, 'Pastry from Heaven', by Michelin-star chef, Michel Roux. 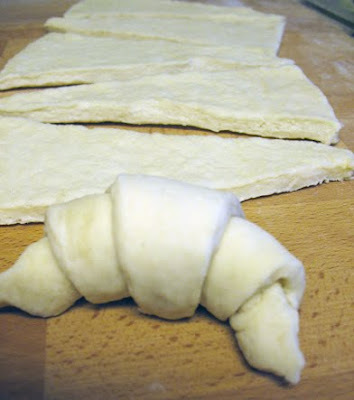 Croissant dough is somewhat similar to puff pastry, in that a slab of butter is incorporated into the mixture and the dough is rolled and turned, but it actually belongs to the family of yeasted doughs, like brioche. This classic dough is used to make various sweet and savory pastries. 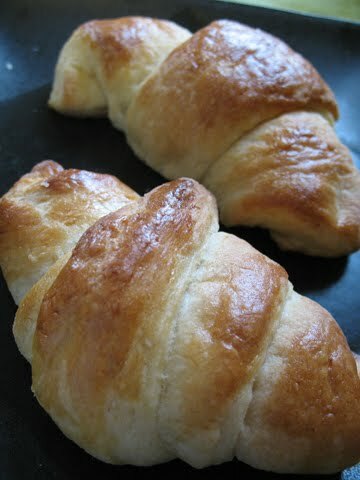 You can freeze unbaked croissants and Pains au Chocolat, after shaping but before brushing with egg, for up to 2 weeks. Separate with waxed or parchment paper so you can remove as many as you like. Dissolve the yeast in the milk. Put flour, salt and sugar in the bowl of an electric mixer with dough hook and mix on low. Gradually pour in the milk/yeast mixture. 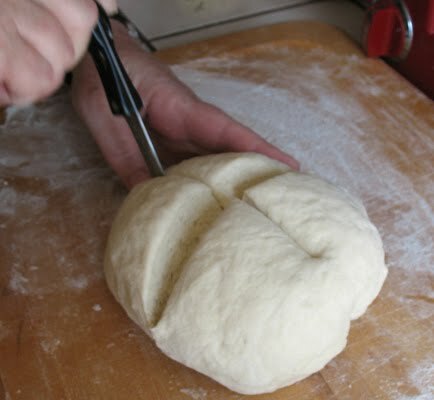 Stop working the dough as soon as it comes away from the sides of the bowl. It should not become too elastic. Cover the bowl with cling film and leave to rise in a warm place (24C, 75F) until doubled, 45 - 60 minutes. 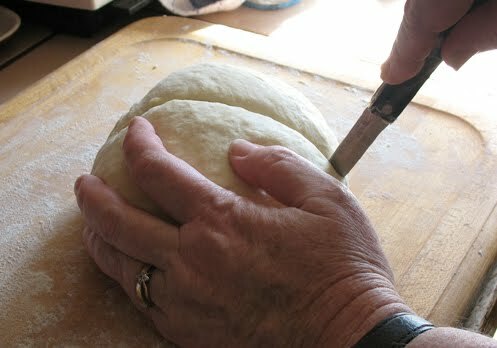 Punch down dough by flipping it over with your hand, but do not overwork it. Cover the bowl again and refrigerate for at least 4 hours but not more than 8. 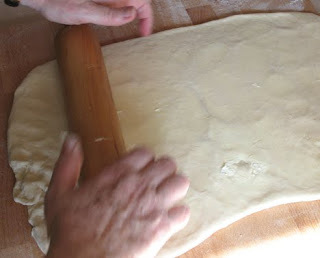 Punch down dough by flipping again and place on lightly floured surface. cut a 3cm (1 1/4") cross in the center. roll out the 4 sides to make flaps. 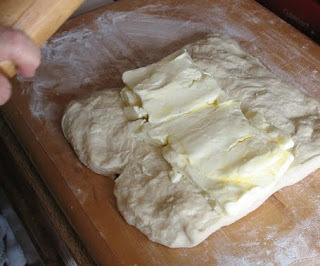 Bash the butter with a rolling pin to make a rectangle and place in the center of the dough. Fold the flaps over to completely enclose the butter. 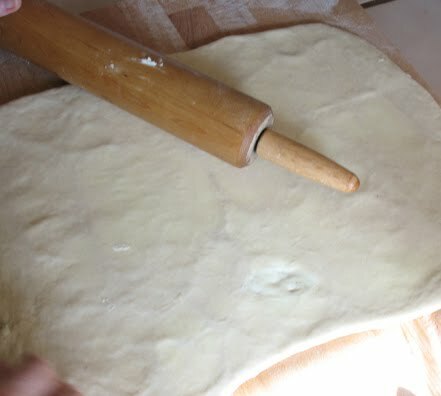 First Turn: Lightly flour the work surface, roll the dough out to a 60 X 30cm (24 X 12") rectangle. Fold in thirds, wrap in cling film and refrigerate 30 minutes. 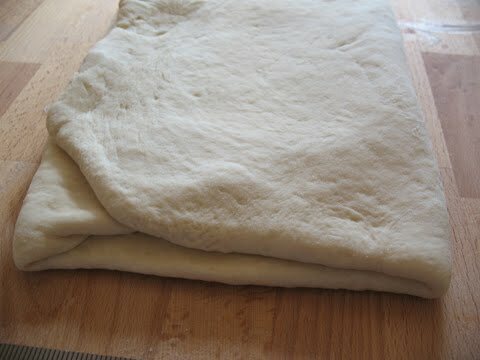 Second Turn: Give the chilled dough a quarter turn, roll out into the rectangle, fold, wrap and refrigerate as above, 30 minutes. 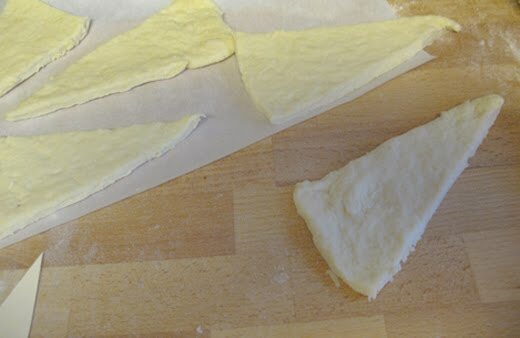 Third Turn: Roll the dough in the opposite direction as before, into the rectangle, fold wrap and refrigerate at least 30 but no more than 60 minutes. The dough is now ready for use. Cut a cardboard template, 9cm (3.5") base, 18cm (7") to the point. 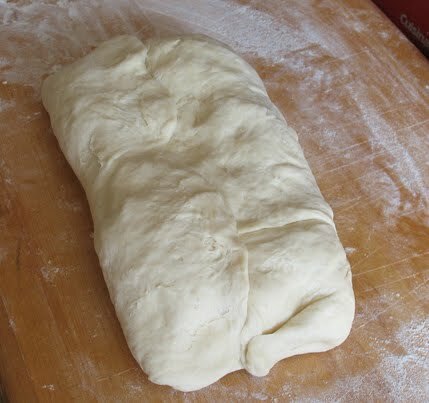 Lightly flour work surface and roll dough out to 65 X 40cm (26 X 16") rectangle. Lift it slightly off the surface to aerate it to keep it from shrinking. Trim sides with a sharp knife to make straight edges, then cut in half, lengthwise. Using the template as a guide, cut into triangles. (You could lay a piece of ham on the base before rolling for a savory croissant) Repeat with the rest of the triangles. Lightly but thoroughly brush with egg wash. Put the croissants, on a baking tray, in a warm, preferably slightly humid, place (24 - 30C, 75 - 86F) to rise for 2 hours, or until almost doubled. Brush with egg wash again, and bake in a preheated oven (170C, 340F) oven for 12 - 14minutes. Happy THIRD Anniversary Bread Baking Babes! Sounds like your kitchen needed to be in my empty kitchen space where the temp was 20° outside and a lovely 60° inside. Ah well, even if you can't trust the weather you can always trust a Babe to pull gorgeous bread from the oven ... assuming there is an oven to pull it out of. Yay! Congratulations to the BBB's! D. is HORRIFYINGLY GOOD at this laminated dough; I could eat his various goodies all day for weeks -- which would be tragic to my health. But MAN are the bear claws he makes with this method tasty! Wow! I admire you so for doing this one again! I think I will come to you and make you teach me how to do this properly next time ok? I'm happy you joined our group and I too admire you for doing these. a wise choice, they are so good! It is perfectly cold up here in Canada - feel free to come on up and make croissants anytime!! 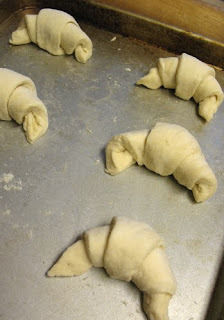 Your croissants look brilliant. Bravissima! I can feel your frustration as the kitchen heats up..... What would normally be a beautiful day becomes a problem - beautiful croissants! Yum yum, I am craving a croissant now. Go Babe Go! Those are GORGEOUS! Well, done, intrepid Babe. You can come up to my kitchen and try these out again. It's chilly here and I would love some warm croissants to go with my tea. OMG, OMG..croissants!! I have wanted to make these for so long, and like I always tell people who are a little intimidated, but have made puff pastry 'It's puff pastry with yeast in the dough!'. Well, you would think I would have made them now, right? Seeing your gorgeous croissants is motivating me, but I want one of yours first!! Beautiful, Elle, just beautiful! OH Wow! Your Own Croissants!! You are just amazing! Those croisants look really good.